Stop standing there idle, help those animals express their frustration. 7/20/09 Update of original art to make all parties happy. Here is a job I recently finished. 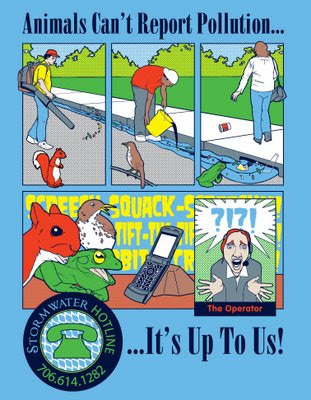 It is for the Athens/Clarke County Stormwater department. 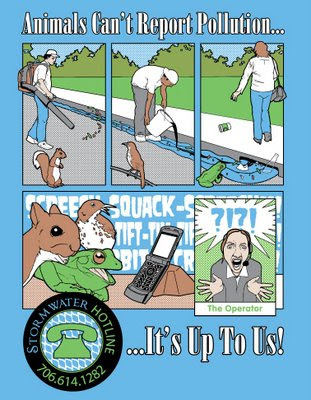 They needed a t-shirt for their new hot-line. It was requested to illustrate the design to look like a graphic novel. This is my attempt. Tell me what you think. This is a 5 color screen-print on a light blue t-shirt. I added an updated version July 17th so you can take a look at the half-tones. Great concept/execution... nice job as always! I like the blue in the background, and I dig the way it has sort of an old eighties feel (a bit). Great blog, by the way! nice art! and it's for a good cause, which is awesome. Hi, I really like your work and hope that this interests you and your readers. If you could add me as a link or give the project a mention I would be really grateful. Hey Josh, I started a new drawing challenge if you're interested! Great style & great message! The top one is actually an attention grabber, the bottom one comes with a cleaner look!